George W. Bush liberated 60,000,000 Muslims from tyranny- More than any leader since World War II. Ten or twenty years from now, historians will view Bush’s actions on the world stage in a more favourable light. America’s 43rd president did after all directly liberate more people (over 60 million) from tyranny than any leader since Winston Churchill and Franklin D. Roosevelt. The broader war against Islamist terrorism has also been a success. There has not been a single terrorist attack on U.S. soil since 9/11, and for all the global condemnation of pre-emptive strikes, Guantanamo and the use of rendition against terror suspects, the fact remains that Bush’s aggressive strategy actually worked. President Bush, in contrast to both his father, George H.W. Bush, and Bill Clinton before him, had a crystal clear, instinctive understanding of the importance of the Anglo-American Special Relationship. Tony Blair may well have been labeled Bush’s “poodle” over his support for the war in Iraq, but his partnership with George W. Bush marked the high point of the Anglo-American alliance since the heady days of Margaret Thatcher and Ronald Reagan. The decision by Bush, with Blair’s support, to sweep the Taliban out of Afghanistan was a brilliant move, one that not all U.S. presidents would have taken. A weaker leader would have gone to the United Nations Security Council and sought a negotiated settlement with Kabul. It was a risky gambit that was vindicated by a stunning military victory in the space of a month, with a small number of U.S. ground forces involved. Bush also made a firm commitment to defending the fledgling Afghan government, and succeeded in building a 41-nation NATO-led coalition. The notion that the resurgence of the Taliban is America’s failure is nonsense. The U.S. has more than 30,000 troops in the country under U.S. or NATO command, making up over half of all Allied forces there. Continental European allies have simply failed to step up to the plate with more troops, with almost the entire war-fighting burden placed on the U.S., UK and other English-speaking countries. Afghanistan is not a failure of American leadership, it is a damning indictment of an increasingly pacifist Europe that simply will not fight. 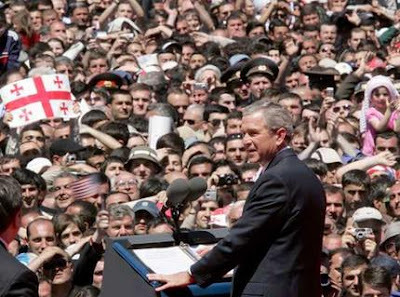 President Bush also recognized the importance of re-shaping the NATO alliance for the 21st Century, backing an ambitious program of NATO expansion, culminating in the addition of seven new members in 2004. He also had the foresight to support the development of a missile defence system in Europe, successfully negotiating deals with both Poland and the Czech Republic. Bush was right to back the eventual inclusion of Georgia and Ukraine in NATO, and both would be well on their way to membership today were it not for the feckless decision of France and Germany to side with Russia in blocking their path to entry. Bush began his presidency primarily as a domestic leader. He ends it as a war leader who has left a huge imprint internationally. His greatest legacy, the global war against Islamist terror, has left the world a safer place, and his decision to project global power and military might against America’s enemies has made it harder for Islamist terrorists to strike against London, Paris or Berlin. There is much more at The Telegraph. Jules Crittenden adds that it is also with tremendous grace that George Bush has accepted his designated role as villain, fall guy, punching bag.